For Chocolate of the Month Club we have partnered with our friends at Heavenly Chocolate Club . We chose them because of the quality and care they take in making their selections. 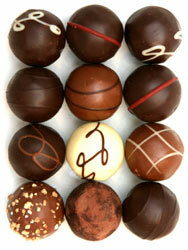 Each month includes a one pound box of gourmet hand-dipped chocolates using the finest all natural ingredients. Explore irresistible selections from the rich creamy taste of Kahlua truffle to the smooth chocolate crunch of a roasted cashew cluster.